The relationship between gays and conservative religious leaders has been tenuous at best. One man, however, was called to the ministry to help change that. The Rev. 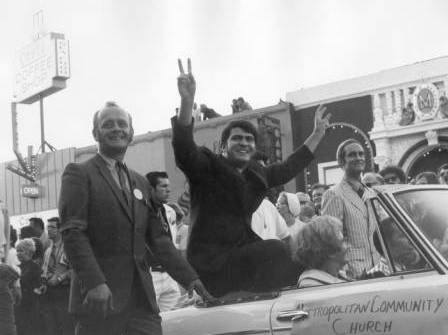 Troy Perry, a founder of the Metropolitan Community Church, was also one of three founders of Christopher Street West, sponsor of Los Angeles’ first Pride parade in 1971. His CSW co-founders were gay activist Morris Kight, who also founded what would become the Gay Liberation Front, and the Rev. Robert Humphries, who also founded the United States Mission, which now serves homeless across the country. Perry had become a Baptist preacher by age 15, in Florida. He married his pastor’s daughter and had two sons. After being caught having sexual relationships with men, at age 19, his Illinois church forced him to leave. The family moved to Southern California, where he pastored a church, eventually divorced and was drafted into the Army. Upon his return to Los Angeles, in 1968, Perry attempted suicide over a failed relationship, and he witnessed a friend get arrested at the Patch, an early gay bar. He then heard the call to be pastor once again, only this time with a worship service gays and lesbians. From that humble start in 1968 — and despite repeated arson attempts on the churches — MCC grew to more than 200 congregations in 33 countries. Perry has been a lifelong minister, activist, and author.